Panaji : With the Bombay High Court due to pronounce an order vis-a-vis a petition seeking to know the health status of Manohar Parrikar, the ailing Goa Chief Minister made a surprise public appearance by visiting an upcoming bridge site -- his pet project -- near Panaji, along with officials and taking stock of the construction activities there. The photographs, some of which were issued by the Chief Minister's Office (CMO), showed a gaunt-looking Parrikar, with medical appendage suspended from his nose and wearing a safety helmet, speaking to government officials and engineers who are overseeing the construction of the third bridge across the Mandovi river off Panaji. 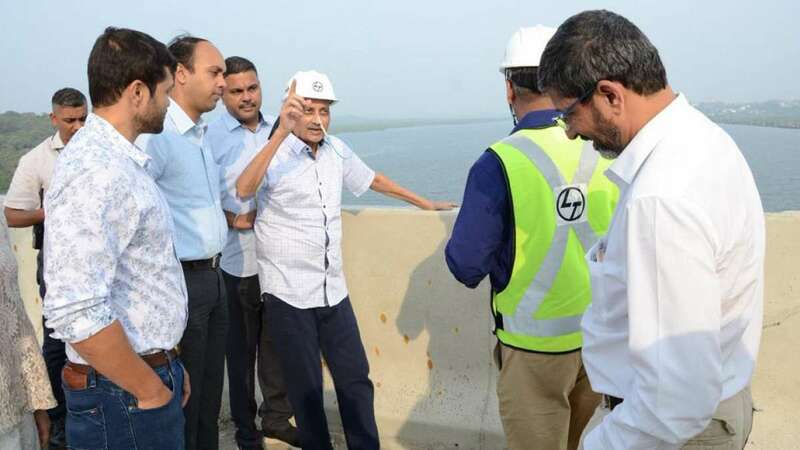 "Manohar Parrikar visited the construction site on the third Mandovi bridge and inspected the progress of work. Officials of GSIDC (Goa State Infrastructure Development Corporation) and L&T engineers were present on the site to brief the CM. He later also inspected the ongoing work of the new Zuari bridge," a statement issued by the CMO said. He returned from New Delhi's All India Institute of Medical Sciences on October 14 and since then Sunday is the first instance when Parrikar moved out of his private residence for official purposes. The Panaji bench of the Bombay High Court last week reserved its judgement, after hearing a petition filed by a local politician Trajano D'Mello who has sought that the Court direct state Chief Secretary Dharmendra Sharma to have the former Defence Minister's health condition evaluated by a panel of expert doctors and release the medical report in the public domain. The Chief Secretary has maintained that the petition was political in nature, while arguing for Parrikar's right to privacy.